It would be safe to say that throughout my seventy-and-one-half-years, I have encountered more than one carpetbagger from time to time. 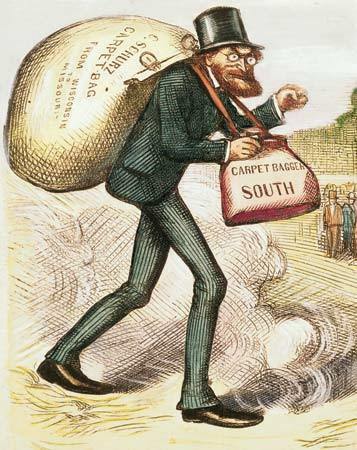 For me, a carpetbagger is someone who tries to find out what you are doing and then attempts to top you. That is the sole purpose of their existence! I knew a person like that for a long time, and I remember trying keep my projects hidden from her. Then I forgot to delete the website links from my signature block in a message I was sending to her. When I read through a volume of her diatribe later, I realized my error and never made it again. Those days are over. However, my previous tormenter appears now to be replaced by two–IF I allow them to continue! It is beyond me why people can’t be happy with their own lives and abilities and stop trying to capitalize on others. If they can’t get through to me, then they try to take a detour through people I know. If I get angry, or if I abandon my project–then they win. If I ignore them (which is pretty much what I have been doing for quite some time)–then they can’t get through to me. I have known them for a long time. The funny thing is, they only seem get worse as time goes on, and their schemes grow in size. At times they are difficult to ignore. I predict the following for my pests: they will embark on their scheme and go only a short distance before erupting. Their enterprise will fall apart, and they will go in different directions, blaming the other for their downfall!